Harold Zieg "Hal" Steinbrenner (born December 3, 1969) is principal owner, managing general partner and co-chairman of the New York Yankees. He and his brother Hank inherited the team from their father, George Steinbrenner, who died in 2010. 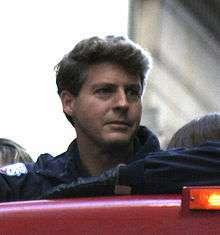 Hal Steinbrenner is the younger son of George Steinbrenner and Elizabeth Joan Steinbrenner (née Zieg). He has two sisters, Jessica Steinbrenner and Jennifer Steinbrenner-Swindal. Steinbrenner attended Culver Military Academy and went on to graduate from Williams College in 1991 with a Bachelor of Arts degree. He then earned a Master of Business Administration at the University of Florida in 1994. Starting in 2007, George Steinbrenner gradually ceded day-to-day control of the Yankees to Hal and his other son, Hank, as his health worsened. Hal Steinbrenner was elected Chairman of the Board of Yankee Global Enterprises on September 28, 2007. On November 20, 2008, Major League Baseball owners approved the shift of day-to-day control of the Yankees from father George Steinbrenner to Hal Steinbrenner. Hal Steinbrenner is Chairman and CEO of Steinbrenner Hotel Properties and is on the Board of Directors of the Boys and Girls Club of Tampa Bay. ↑ Litsky, Frank (March 30, 2007). "BASEBALL; The Steinbrenner Family". The New York Times. Retrieved May 4, 2010. ↑ Tyler Kepner (September 29, 2007). "Steinbrenner Son Elected Chairman of Yankees". The New York Times. ↑ "Statement from Howard J. Rubenstein, Spokesman for the New York Yankees" (Press release). Major League Baseball. November 20, 2008. Retrieved November 11, 2009. ↑ "Executive Profile Harold Z. Steinbrenner". Bloomberg Businessweek. February 5, 2015. ↑ Lenora Lake (March 5, 2014). "Blake High junior thanks Boys & Girls Club for support". The Tampa Tribune.